A nature lover's paradise, Dominica offers plenty of activities based around its majestic landscapes and bountiful wildlife, adapted to both adrenalin junkies and laid-back types. Explore the island's beauty by hiking one of its many trails leading to hidden waterfalls and volcanic lakes, or taking you deep in the Morne Trois Pitons Natural Park. Walk around the botanical gardens and nature reserves, take a dip in the soothing hot springs, or dive deeper into its stunning underwater life and topography. And if the timing's right, let yourself flow to the mesmerising rhythms of the various carnival celebrations, or head to one of Dominica's whale-watching point for some truly breathtaking encounters! Every trail in Dominica offers something special and unique; gorges and valleys, rainforest, streams and rivers, natural springs and boiling mud baths, cascading waterfalls, and a vast array of flora and fauna. You won’t of a photograph or two on this Caribbean holiday! 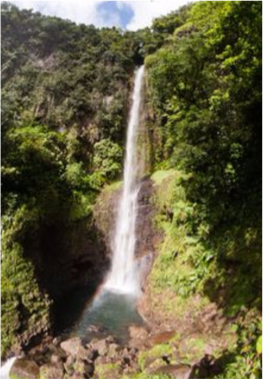 One of the island's most popular attraction, this very easy 10 minutes walk will take you to the beautiful twin Mother (23 metres high) and Father (38 metres high) falls. A moderate 45 minutes walk (1h30 total) takes you deep in the abundant rain forest where you'll be able to spot a variety of fauna and flora, including tropical birds, tree frogs, bats and Yanga Palms. The fall itself is a stunning narrow stream dropping from a 60 meters high keyhole notch in the cliff. A 3 hours hike (rated difficult) up the island's second highest mountain, situated north of Boeri Lake and Morne Macaque. Composed of three peaks, this mountains is also a dormant volcano and this trail offers spectacular views of the surrounding landscapes, whilst taking you through the abundant cloud forest, rain forest, montane forest and elfin woodland. An easy trail highly recommended for nature and bird lovers, who will be able to hear and maybe spot the endemic Jaco and Sisserou parrots. The trail is 8 kilometres long and takes around 45 to 60 minutes one way. Located at the south of the island, at the base of the Soufrière Mountain, one of Dominica's most recently active volcanic areas, these hot water pools are reachable via an easy 30 minutes trail (1 hour total), where you'll find sulphur deposits, fumaroles vegetation and a cold stream. If the two week Waitukubuli trail sounds a bit serious, there are plenty of easier trails which you can just spend a casual afternoon walking. The trails are generally wide with smooth terrain and bridges to cross any streams that come in your way. Accessible from the village of Délices, this moderate 40 minutes trail (20mn each way) leads you to a 53 metres high waterfall that flows into the White River. Located northeast of the Laudat village, over 762 metres above sea level, lies the island's largest lake, in the crater of an old volcano, at the foot of Mome Macaque. The lake is approximately 17 metres deep and spread over 2 hectares. An easy 45 minutes trail (each way) takes you to this stunning location, where you can enjoy some kayaking, boating or simply more hiking! Thirty minutes of moderate hike (1h total) to this fall located within the east coast village of La Plaine. To embrace Dominica's beauty from a different perspective, take a hike up the eastern Caribbean's highest mountain (1,447m). The 3 hours trail (one way), rated difficult, takes you to Morne Diablotin's "popular summit", slightly lower than the actual peak, and starts at 579 metres above sea level. 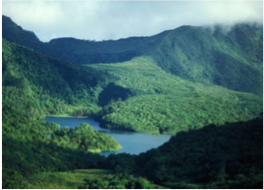 The newly opened Waitukubuli National Trail is the longest hike in the Caribbean and passes through Carib Territory and the Morne Trois Narional park (home to the world’s second largest boiling lake). This hike is truly a hiker’s dream and depending on your fitness or ambition you can pick one of the 14 segments which appeal or tackle the whole trail (allows two weeks at least!). Located 5.6 km northeast of Pont Cassé, on the way to Castle Bruce, the Emerald Pond trail is the most accessible one within the Morne Trois Piton National Park. A 15 minutes walk will take you the lush rainforest where you will be able to enjoy beautiful views of the Morne Trois Pitons and spot local wildlife species, before taking a refreshing dip in the eponymous pool and its waterfall. This freshwater crater lake is the highest on the island and can be reached via a moderate 2km trail from the Freshwater Lake (45mn one way). This trail is regarded as one of the most challenging yet rewarding hikes of the island, a diverse walk showcasing the wide diversity of the island's dramatic landscapes, with the rainforest rising from 540 metres to 690 metres, before descending 30 metres towards the Trois Piton River. An easy, 45 minutes hike that takes you through the site of a 1700s Maroon encampment of escaped slaves named after one of the runaway slaves who found refuge there. 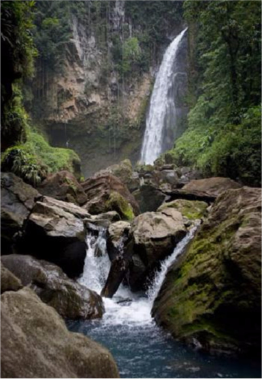 The trail takes you to the Jaco Falls, which is one of its main features. Off-shore, the scenery is just as spectacular. The rocky landscape is replicated under the water with volcanic vents, plunging sea walls joined by brightly coloured reefs and soft corals. The sea turtles and sperm whales help to make Dominica one of the best diving experiences in the world. Located on the southern side of the island, this site is a truly impressive one accessible to all levels, with dramatic topography and beautiful species to admire at every depth, whatever your level. Highly recommended. A diver's favourite on the south of the island, with turtles often spotted there, this site's slight current attracts schools of horse-eye jacks as well as bar jacks and schooling bait fish. Beautiful barrel and vase sponges with golden crinoids are also visible on current-free days. Located on the Atlantic side of the island, this huge rock sitting on a sandy bottom in 60 feet of water features overhangs, swim-throughs and recesses. 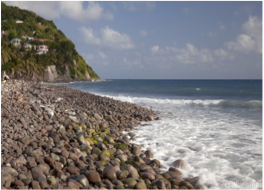 A diver's favourite in Dominica, this site requires a little experience with currents, for it is located where the Atlantic ocean and the Caribbean sea meet, at the northern tip of the island. Get ready to spot many large fish. A beautiful dive accessible to beginners, located at the North of the island and giving you a chance to spot stingrays, turtles, barracudas, eagle rays, moray eels, crabs, lobsters, with black coral, sponges and soft coral. The underwater wildlife world is one which is truly unique; nowhere else in the Caribbean will you get the chance to encounter seahorses, frogfish, flying gurnards and the famous golden crinoids making home amongst the vast coral and sponges. Batfish, electric rays, Caribbean reef squid, sea snakes and sea urchins add to the list of rare undersea inhabitants found in Dominic. This site features an impressive pinnacle with a 300 ft long tunnel bursting with reef fish, creating a real time kaleidoscope in front of your eyes. A shallow dive with mini caves and overhangs, offering one of the best critter dives. Spot the likes of spiny and slipper lobsters, crabs and morays, barrel sponges, hydroids and gorgonians, red heart urchins, sea cucumbers, stingrays, snake eels, as well as the very rare batfish. Located on the southern drop-off of the Grand Savanne flats, this site offers great photo opportunities with arrow crabs, spotted flamingo tongue snails, banded and pederson cleaner shrimp, barrel sponges, azure vases and yellow tube sponges, colourful coral and tropical fish. A shallow dive perfect for beginners with a colourful backdrop of coral encrusted rock formations, sea fans, sea plumes, giant anemones, with wildlife such as schooling chubs, moray eels, stingrays, spotted eagle rays, and nurse sharks. Located Northwest of Scott's Head Pinnacle, this site is filled with tuna, rainbow runners, bar jacks, black jacks, yellowtail snapper and cero, all chasing schooling baitfish. And towards the pinnacle, masses of creole wrasse as well as brown and blue chromis, a few barracudas, and a colourful wall of giant barrel sponges. 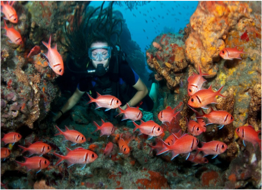 Dominica's dive sites are mostly found on its western coast, and below is a selection of the island's finest. Located at Dominica's south end, this site takes you to a cavern inside the crater of an old submerged volcano, leading to a spectacular wall with seahorses, lobsters, barracudas and big yellowtails. Swim further through a curtain of schooling soldierfish and emerge on top of the Swiss Cheese rock formation where you'll see scorpionfish and frogfish. Named after the shape of the barrel sponges found there, this site is located at the south end of the Cabrits National Park peninsula, at the North of the island. A colourful mix of vase and tube sponges with schools of blue chromis and tang create a stunning palette that is a real treat for the eyes. This much wilder area offers a superb backdrop of healthy coral, with plenty of crinoids, huge barrel sponges and walls of dense deep-water sea fans that are home to shy seahorses, and create the ideal settings to meet schooling black durgons, big stingrays, turtles, and huge barracudas. One of the island's wreck sites, just off Cottage Point, where divers will find the remains of 18th century wreck, with neighbouring pinnacle hosting colourful maritime wildlife. Other sites include: Cabrits, Champagne, Pointe Guignard (all Easy level), Coral Gardens & Batali Pinnacles, Douglas Point, Pointe Ronde & the Craters (all Intermediate level), Five Finger Rock, Mountain Top (both Difficult level). 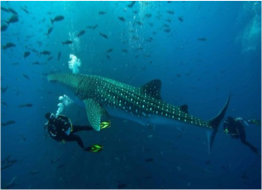 Whilst diving sure is a favourite on the island, there are many other aquatic activities to be enjoyed throughout the year, including turtle and whale watching, canoeing, kayaking, river tubing and rafting. Dominica's capital is a charming mix of modern architecture and Victorian houses, a densely populated market town counting 20,000 inhabitants and set at the foot of a beautiful backdrop made of the island's lush green mountains. Dominica's volcanic origins have blessed the island with many thermal springs, rich in mineral deposits that are believed to be therapeutic and healing. With pools naturally varying in temperature, ranging from cool to very hot, it is a common activity for visitors to soak in multiple springs to soothe their pain and worries away. Dominica's most popular springs are Tia's, Ti Kwen Glo Cho, and Screws's Spa. A short minute boat ride from Portsmouth up the Indian River reveals a piece of Dominica's wildlife, as your boat drifts slowly along the swampy river bank, revealing the island's beautiful fauna and flora. Water sports lovers will also enjoy the country's annual Dive Fest, taking place at the beginning of July and organised by the Dominica Watersports Assocication: whale watching deals, special dive packages, canoe and traditional boat races, snorkelling picnics, marine educational tours and more. Once a place for slave trading, punishment and public gatherings, the historical cobblestoned area is now a craft and souvenirs plaza with market stall selling local items such as essential oils, spices, tropical fruits and handicrafts. Home to Dominica's indigenous Carib Indian people and spreading over 3,700 acres, the Kaligo Territory, also known as Carib Territory, is a great way to get acquainted with the island's roots. Meet the warm and friendly Carib people and explore the ancestral traditions through their crafts, cuisine and canoe building. The island's many underwater drop-offs create the ideal shelter for the Sperm Whale to breed and calve and, although there are more often spotted between November and March, Dominica is the only country in the world where Sperm Whales live all year round. Located in the city of Roseau, this 40 acre large oasis is home to the endemic Sisserou Parrot, Dominica's national bird, as well as housing over 50 types of indigenous plants and imported trees. Stretching over 1,313 acres on a dramatic peninsula at the north of the island, this national park aims to protect and preserve tropical forests, wetlands and coral reef, and is also home to Fort Shirley, which once housed 600 British soldiers. Also known as the "Real Mas", this pre-Lenten festival marks Dominica's most festive season, where the island beats to the Caribbean steel drums and the streets are filled with colourful costumes and smiles. Carnival Monday and Tuesday are dedicated to street parties and bands in flamboyant costumes. A family event that was first introduced in 2010 and that mixes jazz music with Creole music, food and culture, taking place during the Pentecost holiday weekend at the Cabrits National Par's Fort Shirley. An event considered by most as the highlight of the Carnival season and highlighting the talents and beauty of Dominican women. An impressive West-African costume tradition that recently reappeared in the Carnival rituals. A yearly celebration of Creole spell-binding beats and colourful sounds over three October nights of live music. A competition between dozens of Calypsonians with eliminations resulting in the grand finale known as the Calypso Monarch Competition. A large and joyous competition between the country's many steel bands! Running from April to June, the Dominica Festival of Arts is a yearly festival aiming to promote and encourage the local artistic expression through a series of performances, shows and workshop revolving around the performing and fine arts.